Like many of life’s treasures, the Nash-Healey’s birth was an unlikely confluence of events. Its beginnings sprang from a chance meeting in 1949 aboard the Queen Elizabeth, between Donald Healey and George Mason, president of Nash-Kelvinator Co. Mason wanted a sports car to improve the image of his automobile company and Healey was on his way to back to England after failing to acquire Cadillac engines from GM for his new sports car. They agreed that motor racing was a necessity in the development and promotion of a sports car. Mason thought his Ambassador engine would be perfect. The rest, as they say, is history: America’s first true sports car, designed from the beginning to go toe to toe with the world’s finest. Conceived with the engineering genius of England’s master car designer and nurtured by the financial backing of a great American industrial corporation, the results were predictable – one of the great cars of the age. As soon as first prototypes were ready, they began to appear on the race tracks of the world among some very famous company. 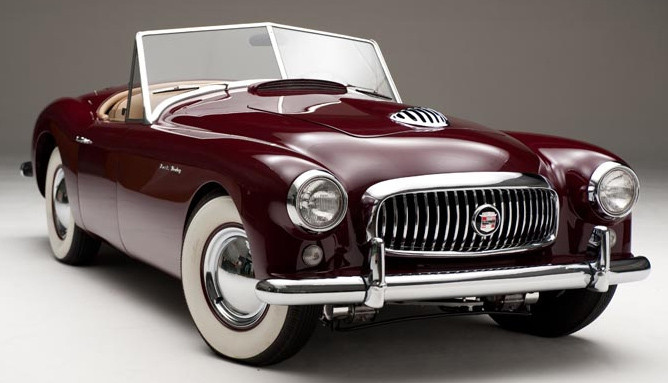 The Nash-Healey is a two-seat sports car that was produced for the American market between 1951 and 1954. Marketed by Nash-Kelvinator Corporation with the Nash Ambassador drivetrain and a European chassis and body, it served as a halo (or image) vehicle, or flagship car, for the automaker to promote the sales of the other Nash models. It was "America's first post-war sports car", and the first introduced in the U.S. by a major automaker since the Great Depression. The Nash-Healey was the product of the partnership between Nash-Kelvinator Corporation and British automaker Donald Healey. Later on, the car was restyled by Pinin Farina and subassembly begun in Italy. The car had drum brakes all round. Wheels were steel, dressed up with full-diameter chrome hubcaps and 4-ply 6.40 x 15-inch whitewall tires. The interior featured luxurious leather upholstery, foam rubber cushions, adjustable steering wheel, and a cigarette lighter. Completed vehicles were shipped to the United States for sale through the Nash dealership network. A prototype was exhibited at the Paris Motor Show in September 1950. The production model debuted at the February 1951 Chicago Auto Show and Donald Healey gave the first example to Petula Clark. The only colors available were "Champagne Ivory" and "Sunset Maroon", and the suggested retail price (MSRP) of US $3,767 F.O.B. New York City proved uncompetitive. The Nash-Healy was a top three finisher after the Mercedes-Benz team one and two at Le Mans in 1952. This is truly a unique automotive treasure.